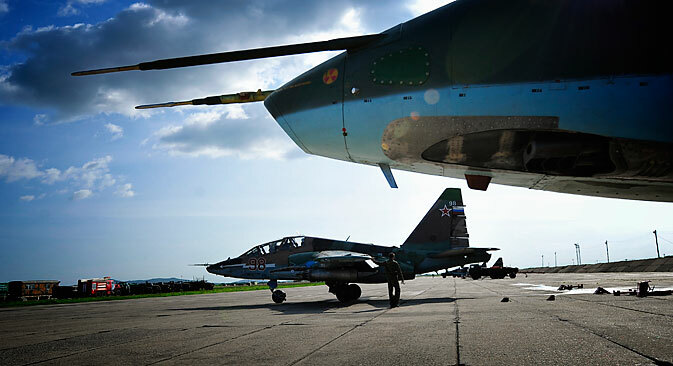 Russia has inked a deal with Iraq to supply the troubled Middle East nation with Russian Su-25 fighter planes. The aircraft could be of crucial aid to the Iraqi authorities as they struggle to check the advances of the ISIS militant Jihadist group, which has taken control of large swathes of Iraq. Moscow and Baghdad have signed an urgent contract to supply Iraq with Russian Su-25 attack aircraft (estimates vary from five to 10 units). For Iraq, these supplies are a matter of national security. Iraqi PM Nouri al-Maliki’s government is in dire need of attack aircraft in order to support ground forces on their mission to confront Islamists from the Islamic State of Iraq and the Levant (ISIS), who have taken control of large parts of the country in recent weeks. Initially, the Iraqis turned to the United States for help. They asked Washington to either bomb the Islamist forces or immediately supply Iraq with aircraft. Technically, this should have been an easy task. "The Americans have their reserves of aircraft that are in much better shape than ours. If they wanted to, they could meet the needs of Iraq,” Russian military expert Konstantin Makiyenko explained to RBTH. However, the U.S. government has denied all requests from Iraq, and has even refused to speed up the process on existing contracts. “Iraq has signed a contract to supply F16 fighter jets and Apache helicopters, but the aircraft will not be delivered until the fall,” said Andrei Sushentsov, partner at the Foreign Policy Agency and assistant professor at the Moscow State University of Foreign Affairs. Sushentsov explained that Bob Menendez, head of the Foreign Relations Committee, refuses to move contract deadlines to an earlier date. “Menendez opposes al-Maliki’s authoritarian regime, which oppresses the country’s Sunni minority. The U.S. fears that the ‘shiatization’ of the regime in Iraq will strengthen the country’s ties with Iran,” he said. Since Iraq has already cooperated with Russia militarily, the country has turned to Moscow for help after encountering opposition in Washington. A number of American media sources have reported that Russia has sent combat pilots to Iraq along with attack aircraft. The Russian embassy in Iraq has confirmed that Russian specialists are currently in Iraq but will not be bombing the Islamists. “Their objective is to, first of all, assemble the supplied equipment and, secondly, to ensure that the aircraft flies properly. Our pilots will not be flying and taking part in military operations. This is forbidden,” Russian Ambassador to Iraq Ilya Morgunov told RIA Novosti. Experts agree that sending Russian pilots in would make no sense. “First, this move carries serious risks for Moscow,” said Ruslan Pukhov, director of the Center for Analysis of Strategies and Technologies. “If any of our soldiers are taken as prisoners, the whole world will be watching a Russian pilot get his head cut off in Iraq. “Second, Iraq has domestic specialists, as well as pilots sent to them by Iran [Iran has already sent an Su-25 group to Iraq, and there is a total of 13 such aircraft in the Islamic Republic – RBTH]. In the worst-case scenario, Iraq can borrow pilots from the Syrians or hire them on the open market,” said Pukhov. Officially, Washington has supported the contract between Russia and Iraq. “We are not surprised that Iraq is working with other countries in order to obtain the necessary equipment. We are not against legal attempts by Iraq to obtain the military equipment that they need,” said the spokesperson for the U.S. State Department Jen Psaki. “The U.S. reacted well to the contract because they do not see it as Iraq’s strategic move to prioritize Russia over the United States. ISIS is just as much of a threat to Moscow as it is to Washington,” said Andrei Sushentsov. Theoretically, there is a reason to monitor the situation - Russia intends to strengthen its ties with the Iraqi government, especially with respect to military weapons. “Iraq needs a large number of helicopters, attack aircraft, and bombers because the Iraqi Air Force is not very strong right now. Thus, the possibility of further purchases is very high,” said Konstantin Makiyenko. There are also some solid developments in the non-military sector, and such developments can literally be life-savers for Russian companies. “Agricultural equipment orders prevented two Russian factories that manufactured such equipment from going bankrupt. That is just one example,” said Ilya Morgunov. According to him, Russian companies have attractive prospects in terms of working with Iraq, at least with regard to restoring facilities that were built by Russian specialists a long time ago (power stations, for example). The main barrier to cooperation is the safety issue. The Russian embassy has estimated that safety issues will account for about a third to a quarter of the cost of the entire contract. If ISIS is defeated, this expense will most likely decrease. At the same time, we should not be in a rush to overstate Russia’s interest in Iraq. The Kremlin has no intentions and no desire to turn the country into a stronghold in the Middle East (especially given that Iraq’s neighbor, Syria, is far more suitable for this role. “Russia doesn’t have any vital interest in Iraq that would force it to compete with the U.S. Moscow is going to use the current situation in order to establish itself as a military equipment supplier and an important participant in the system of regional security,” said Sushentsov.